Not to be confused with Dance Dance Revolution X. North American Revolution X arcade flyer. Revolution X is an arcade rail shooter game developed and published by Midway in 1994, featuring the rock band Aerosmith. It features gameplay similar to Midway's earlier Terminator 2: Judgment Day. In the game, players battle the oppressive New Order Nation regime and their leader Helga, who have abducted Aerosmith. Players use a mounted gun to control onscreen crosshairs and shoot enemies using compact discs. The members of Aerosmith are hidden throughout the game's international locales and must be found in order to receive the game's true ending. The game was a critical and commercial success, and was ported to various consoles as well as DOS computers. These ports were negatively received and reportedly dissuaded Midway from making a sequel. In a dystopian version of 1996, an alliance of corrupt government and corporate military forces have taken control of the world in the guise of the "New Order Nation" (NON). The NON, with their vampish commander Head Mistress Helga (portrayed by Kerri Hoskins)), have declared war on youth culture (anyone aged from 13 to 30) and have banned all forms of music, television, magazines, and video games. The player travels to "Club X" in Los Angeles to see Aerosmith perform live, but the band is captured by NON troops and hustled off the stage in the middle of their show. After escaping from the club, the player steals a helicopter and flies across the city to find the band's car. From here, the player must destroy three NON installations in other parts of the world, then travel to London to defeat Helga and her remaining forces at Wembley Stadium. Revolution X is a rail shooter in which the players must shoot targets including NON soldiers and vehicles, with the ultimate goal of rescuing the band. Players start the game at Club X in Los Angeles, first fighting the NON troops inside and then stealing a helicopter to fly across the city and find Aerosmith's car. They must then destroy three NON facilities in the Amazon jungle, the Middle East and the Pacific Rim. These three stages may be played in any order; however, failing to complete the Middle East stage within a set time limit will send the players back to its start for another attempt until the bus is destroyed. Finally, the players advance to Wembley Stadium for the final battle with the surviving NON forces and Head Mistress Helga. Throughout the game, objects can be shot that may reveal power-ups like health-replenishing shakes, CD's, powerful laserdiscs and Super Guns, Skull Bombs and shields. Players can also find hostages and free them throughout the game for extra points. At the end of each stage, the players receive bonus points based on the number of enemies killed and hostages rescued, as well as the amount of damage done. The five members of Aerosmith are hidden in secret locations throughout the game. When found, each member presents the player with a set of Aerosmith wings that increase the end-of-stage bonus. All members must be found in order to see the best ending, in which the players go backstage after blowing up Helga, and can collect high-value Mammy Awards, as well as party with the band. Mortal Kombat II features an advertisement with the old Revolution X logo that arcade operators could toggle on and off. Occasionally after a large in-game explosion, Steven Tyler can be heard saying "Toasty!" in a high-pitched voice in reference to an easter egg in Mortal Kombat II. The game was originally developed as a title based on the film Jurassic Park. However, Sega acquired the rights instead and eventually released its own arcade game based on the film. 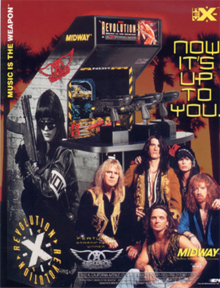 Midway then retooled its concept to revolve around Aerosmith. The first release labeled Proto 5.0 (5/23/1994) is lacking several speech samples spoken by members of Aerosmith which can be heard after collecting power-ups and has a shorter Pacific Rim level. Revision 1.0 (6/16/1994) restored the missing speech samples and has the complete Pacific Rim level and completed two new crosshairs in P2 and P3. Revolution X was released as upright two player and deluxe three player arcade units and as a conversion kit for existing gun games such as Terminator 2: The Arcade Game. Another Revolution X featuring the hip-hop group Public Enemy was considered, but reportedly scrapped after the negative reception that the home versions of the original Revolution X received. The soundtrack consists of several Aerosmith songs continuously looped, including "Eat The Rich", "Sweet Emotion", "Toys in the Attic" and "Walk This Way". A Muzak version of "Love in an Elevator" plays in the elevator part of the Amazon Jungle level. The soundtrack was featured in the CD Offer after playing or during attract mode. The console versions included loops of "Rag Doll" for the attract screen, main menu, and score, "Fever" for the Middle East level, and "Dude (Looks Like a Lady)" for the ending. The game was later ported by Rage Software and Software Creations, and released by Acclaim for DOS computers, the Super NES, Sega Mega Drive, PlayStation, Sega Saturn. A Sega 32X version was demonstrated at the 1995 Electronic Entertainment Expo, but was never released, and possibly never completed. A Atari Jaguar conversion was also in development and slated to be published around the fourth quarter of 1995, but it was never released. None of the home versions are light gun compatible. The Super NES and Sega Mega Drive ports tone down the blood and the exotic dancers (also played by Kerri Hoskins) who were showing off their thongs have been turned around so they are facing the screen. CD-based console versions feature more blood, but the dancers are still facing the screen. GamePro gave the arcade version a rave review, praising the ability to choose from multiple paths, the numerous secret items, the sharp graphics, and the Aerosmith soundtrack. They concluded "Rev X is not a revolution in gun games, but it's definitely the best one yet." The home versions of the game, however, were thoroughly condemned by critics. The four reviewers of Electronic Gaming Monthly highly praised the digitized voices and music of the SNES version, with two of them going so far as to say they were the best they'd heard on any 16-bit console, but nonetheless concluded it to be an inexcusably poor conversion. They particularly noted the absence of many graphical details from the arcade version and the awkward, sluggish movement of the control cursor. GamePro's The Axe Grinder also criticized the graphics and controls, remarking that "Moving your target sight is a breeze, but accurately pinpointing small targets is difficult." He disagreed with EGM on the audio, describing the music as dull and the sound effects as infrequent and muted. In the same issue, Air Hendrix found the same targeting problems in the Genesis version, and said it "desperately needs" light gun support. He also found the graphics to be grainy and choppy and the sounds to be static-ridden. Reviewers for Next Generation ridiculed the "laughable graphics, indistinguishable digitized voices, and awful music", and added that the game is overly repetitive and simply not fun. Scary Larry of GamePro panned the PlayStation version. Citing prominent slowdown, mediocre graphics, and a bland soundtrack, he assessed that "With standard shooting that doesn't live up to its arcade counterpart, Rev X seems like an old game wheezing through on its past reputation". Next Generation commented, "This shooter ... was popular in the arcades, but this conversion is abysmal." IGN gave the PlayStation version a 1 out of 10. They complained of slow controls and poor graphics and concluded that "Revolution X isn't the worst game ever made, but it sure comes close." Echoing Scary Larry's assessment of the PlayStation version, GamePro's Bruised Lee commented that "Acclaim took Midway's smash arcade hit and turned it into a complete miss for the Saturn." He complained of blocky graphics, dull backgrounds, repetitive gameplay, extreme slowdown, and poor sound effects. Sega Saturn Magazine summarized it as "An incredibly bland and monotonous game matched only by the blandness and monotony of the band that endorse it", citing overlong boss fights and a lack of intelligent design to where the enemies appear. Electronic Gaming Monthly's Seanbaby placed the Super NES version as number 10 in his "20 worst games of all time" feature. ^ Barnholt, Ray. "Aerosmith Can't Catch a Break". 1up. IGN. Archived from the original on 2013-03-02. Retrieved March 5, 2013. ^ Covert, Colin (1996-02-09). "She's no mere Mortal; Fridley native Kerri Hoskins puts edge on `Sonya Blade'". Star Tribune. Archived from the original on 2013-01-25. Retrieved 2008-09-29. ^ Cook, Brad. "Revolution X – Review". Allgame. Rovi. Archived from the original on 2014-11-15. Retrieved March 5, 2013. ^ Weiss, Brett Alan. "Revolution X – Overview". Allgame. Rovi. Archived from the original on 2014-11-15. Retrieved March 5, 2013. ^ "YouTube: Mortal Kombat II 1 credit clear run". Archived from the original on 2016-06-03. Retrieved 2017-09-11. ^ a b Ungerleider, Neal (November 15, 2007). "The Rocky History of Rockers in Videogames". Wired. Condé Nast. Retrieved March 5, 2013. ^ a b Revolution X at the Killer List of Videogames. Accessed March 5, 2013. ^ a b c "Revolution X". November 25, 1996. Archived from the original on 2013-08-08. Retrieved March 5, 2013. ^ "32X-Pectations". GamePro. IDG (83): 38. August 1995. ^ a b "Review Crew: Revolution X". Electronic Gaming Monthly. No. 78. Sendai Publishing. January 1996. p. 26. ^ Weiss, Brett Alan. "Revolution X – Review". Allgame. Rovi. Archived from the original on November 16, 2014. Retrieved March 5, 2013. ^ a b "Revolution X". Next Generation. No. 14. Imagine Media. February 1996. p. 175. ^ a b "Don't Walk This Way". Next Generation. No. 15. Imagine Media. March 1996. p. 96. ^ a b "Every PlayStation Game Played, Reviewed, and Rated". Next Generation. No. 25. Imagine Media. January 1997. p. 59. ^ "Every Sega Saturn Game Played, Reviewed, and Rated". Next Generation. No. 25. Imagine Media. January 1997. p. 65. ^ a b Allsetter, Rob (May 1996). "Review: Revolution X". Sega Saturn Magazine. No. 7. Emap International Limited. pp. 78–79. ^ "Hot at the Arcades". GamePro. No. 62. IDG. September 1994. p. 24. ^ "ProReview: Revolution X". GamePro. No. 89. IDG. February 1996. p. 74. ^ "ProReview: Revolution X". GamePro. No. 89. IDG. February 1996. p. 70. ^ "ProReview: Revolution X". GamePro. No. 91. IDG. April 1996. p. 72. ^ "ProReview: Revolution X". GamePro. No. 91. IDG. April 1996. p. 81. ^ "Seanbaby's EGM's Crapstravaganza - #10: Revolution X (SNES)". Seanbaby.com. Archived from the original on 2006-07-07. Retrieved 2019-01-05.